Fully updated and revised third edition! Have Christians underestimated the power of God’s truth to transform entire societies? Darrow L. Miller is co-founder of the Disciple Nations Alliance, the author of numerous books, and a popular conference speaker on topics such as Christianity and culture, apologetics, worldview, poverty, and the dignity of women. This is a must read for missions thinking! Its all about our worlfview and what that is based on! Jesus commanded his followers to "make disciples of all the nations." This includes sharing the Good News of peace with God through Christ with individuals; it also includes planting churches... but discipling a nation is SO MUCH MORE. This concept of "discipling the nations" will take us beyond evangelizing our neighbors and reaching 'unreached people groups' to "obeying all that [Christ] has commanded." God is not satisfied with part of our lives. Mr. Miller's call to live CORAM DEO - live all of our lives before the face of God - both challenges me and fills me with hope. I didn't realize how much my worldview has come from my culture. His case for a Biblical worldview is compelling, especially when compared to the evidence and the competition. More radical than liberalism and with a richer history than conservatism, I expect Mr. Miller's ideas to provoke a strong response from both social action Christians and Church planting missionaries. 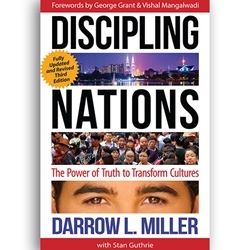 I realize Mr. Miller's work with Food for the Hungry targets the poorest of the poor - but this concept of "discipling nations" has radical implications for every congregation and mission agency in the world. He leads us to recover the depth and breadth of the Church's Mission. I hope his book stirs the Missions community as much as 'people groups' did at Lauzanne in the early 70's. DISCIPLING NATIONS certainly has the potential. This is a "must read" for anyone interested in missions, especially compassion ministries.